September 11, 2001: 19 members of the extremist Muslim terrorist group al-Qaeda, used four hijacked aircraft to crash into the twin World Trade Center buildings, the Pentagon, and a field in Shanksville, PA. 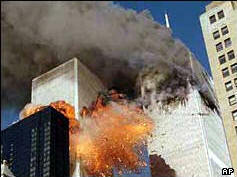 The final death toll includes nearly 3000 souls on the planes, in the ground targets, and rescue personnel. Many countries have joined the fight against terrorism, many appease out of cowardice, and many actively abet the enemy. We build up, they tear down. We spread freedom, they spread tyranny. We heal the sick, they kill and maim. Every citizen of the world pays the price in lost opportunity due to resources expended fighting the terrorists. We shall defeat this enemy both from without and from within - no apologies. 1816: German optician Carl Zeiss, of precision optics fame, was born. 1845: Jean-Maurice-Émile Baudot, who created a telegraphic code that eventually replaced Morse Code, and after whom the term "baud" is named, was born. 1884: Harvey Fletcher, who first demonstrated stereophonic sound, was born. 1937: Astronaut Robert Crippen, who piloted the first Space Shuttle, Columbia, was born. 1946: The first mobile long-distance car-to-car telephone conversation took place between Houston, TX, and St. Louis, MI. 1997: The Mars Global Surveyor went into orbit around Mars.